Why you’re breathing in dinosaur burps? What poos in your bed 20 times a day? What happens when you drop a rabbit through the centre of the earth? If you’re sick to death of science, you need THIS BOOK! From the dizzy science of daydreaming to the stunning science of skyrockets, and from the deadly science of dinosaurs to the Ugly Bug Olympics, this whirlwind whistle-stop tour of science shows you the world as you’ve never seen it before (i.e. VERY FOUL!). 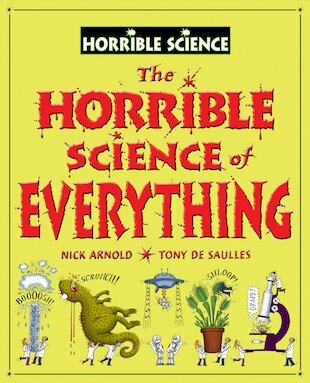 Best of all, it’s stuffed with the WEIRD and INTERESTING science that you never ever get to learn at school! This is a brilliant big hardback book full of so many science facts. Anything you want to know is in here! It is lots of the smaller paperback books all put together and is really good value for money! I think this book is very informative, and very funny, but unfortunatley not as funny as the smaller books. Also I don’t really like the glossy paper. I would prefer the normal paper.